One of the goals of the College Counseling Program at Wardlaw + Hartridge is to work as partners with students in their college search and help them navigate the ever shifting college landscape. We mentor students as they assess their strengths and aspirations, explore appropriate college choices, and work through the process of essay writing, college visits and college applications. Below are some links that students will find very useful. What is our school’s CEEB code? The school code for Wardlaw-Hartridge is 311-230. Students need to know this code when registering for College Board's SAT testing, ACT testing and when applying to college. Generally speaking, students should take the SAT once in the spring of their junior year and again in the fall of their senior year. We do not recommend that students take the SAT any earlier than January of their junior year unless it is required for entry into other programs. Students should map out a strategy early on as to when they will take each required test, including Subject tests. Should I take the SAT II test? 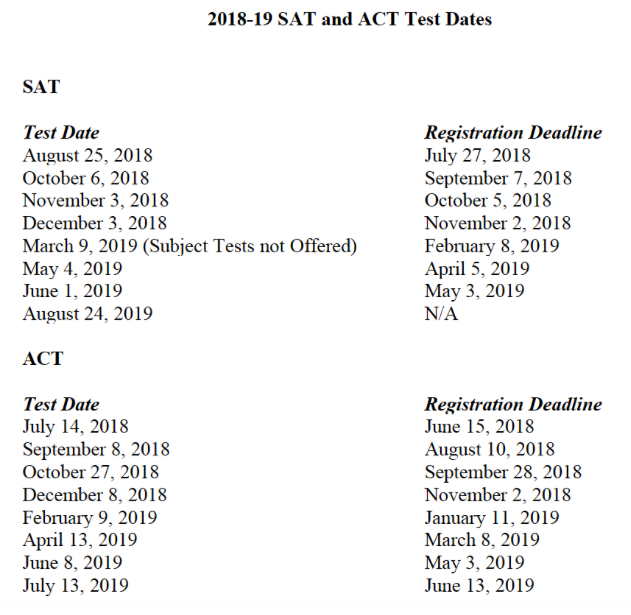 Students interested in applying to highly competitive institutions should take several SAT II tests, preferably by the end of the junior year. Many of the most competitive institutions require that applicants take anywhere between one and three SAT II tests, and some stipulate that math and/or English be among those tests. Some institutions will accept the ACT test in lieu of the SAT I and SAT II tests. It is important to thoroughly research the admission requirements of each college to ensure that you take the appropriate tests. Should I take the ACT test? Most colleges will accept either the ACT or the SAT, but you should check to see if they prefer one over the other. Try to take both tests to determine which set of scores will put you at an advantage. The College Counseling Office can help you with this. To assess the difference in questions, sections, and scoring, look over the materials in the college counseling office or log on to www.collegeboard.com and www.act.org. Note that when it comes to having scores sent to colleges, there is Score Choice. The single most important part of a student’s application is the transcript, which indicates what courses the student took and his or her final grades in those courses. Thus it is important that students undertake an appropriately rigorous course load and do their best in every class. Other factors considered (to varying degrees depending on the institution) include: demonstrated passion for learning, college entrance examinations, extra-curricular activities, teacher and counselor recommendations, the application essay, the interview (if applicable), and special talents. What should high school freshmen do in order to be a strong candidate for highly competitive colleges? As freshmen, you should prepare for college by working hard, taking challenging courses, reading often on a wide range of topics, and remaining committed to your passions and talents. Grow in leadership skills by initiating new activities or projects and by seeking leadership positions. Spend your time wisely throughout the school year and during the summer months; what you choose to do in your “free” time will tell colleges a lot about what you will bring to their campuses. What summer activities do colleges like to see on applications? Colleges like to see that you spend your time doing something you value and consider worthwhile – something that will contribute to your growth and enrichment. Anything from a summer job to pre-college programs to community service to travel can become a significant experience, provided that you make the best of the opportunity and learn and grow from it. Why visit college campuses? When is the best time to visit? A visit to campus will better enable you to determine if the college is a good fit for you, as colleges, like people, have different “personalities” as well as different programs. Preliminary visits can start early in high school, enabling students to begin to assess and prioritize the factors that play into decision-making, particularly in regard to campus size and environment. More in-depth visits should begin no later than spring of the junior year. Summer visits provide an introduction to the school’s programs and campus, and sometimes it is easier to get an interview slot at that time of year (if you are entering senior year). A return visit in the fall enables students to visit classes, talk with students and professors, and experience more fully what it might be like to be enrolled there as a student. It is important to note that many colleges track visits to campus in an attempt to assess a student’s level of interest in that college; a student’s “demonstrated interest” often plays an important role in admission. Is it better to take a regular college prep class and earn an A or honors or AP classes and earn a B? College admissions counselors have quipped, “It’s of course better to take the honors or AP class and earn an A!” But they would definitely counsel you to take the more rigorous class, provided that it is appropriate for you to do so, even if it means a slightly lower grade in the end. Taking a less rigorous course load in the interest of protecting your GPA is not encouraged. Do all colleges require interviews? Not all colleges require interviews, but some do -- either by admission staff members or alumni. Others recommend but do not require interviews, and some do not offer interviews at all. It is important to be clear about what a college's interview policy is so that you can make whatever arrangements might be necessary. If an interview is offered, it is generally in your best interest to arrange for one. You also might want to ask if interviews are informational or evaluative; only in the latter case will the interview be considered as part of your application review. What are the various admission plans offered by colleges and universities? Early Decision is the process whereby a student makes a commitment to the institution where he or she will enroll if admitted. Students may only have one Early Decision application at any time and will withdraw all other applications if accepted. Early Decision deadlines generally fall during the month of November; students should hear between mid-December and the end of the year. Early Decision 2 is similar to Early Decision except that the due date is later. ED 2 allows students more time to commit to one school and/or to build a stronger application. Students often receive an admission decision by February. Early Action allows a student to submit an early application and receive a decision well in advance of the normal response date without having to make a commitment to enroll at that school if accepted. Students may apply to other colleges and adhere to the May 1 national reply date. Regular Decision is the process through which an institution reviews most of its applications prior to notifying the majority of its candidates. Students are notified by early April and have until May 1 to decide where to enroll. Rolling Admission refers to the process through which an institution reviews applications as they are received; students generally receive an admission decision within six to eight weeks. Students may apply to other colleges and have until May 1 to send their deposit. Applying earlier to schools that have rolling admission can positively influence the admission decision. Early Decision applications are recommended options only for students who have done their research early and thoroughly and who are ready to commit to one institution. Remember that students may only submit one early decision application; the only exception to this is when a student is denied under one school’s early decision plan and chooses to apply to another school’s early decision plan whose deadline has not yet passed. If a college offers a rolling admission plan, then yes, it is prudent to submit your application early; delaying the submission of your application may place you in a more competitive pool as the number of available spaces decreases. Students are sometimes tempted to apply to an excessive number of colleges, thinking that this approach might yield at least one acceptance at a most competitive college. However, a long list of applications generally suggests that a student has not done enough self-analysis or research and is approaching the process somewhat haphazardly. Moreover, it is nearly impossible to do a thorough and thoughtful job of visiting, interviewing, and preparing a dozen or more applications while maintaining high standards academically and extra-curricularly. A student applying to a good range of schools should not need to apply to more than ten. The financial aid offices at the colleges are often the best place. They can tell you what merit scholarships they may offer, what forms beyond the FAFSA (if any) are required, and information about how they typically package financial aid. Registration guides for the CSS Financial Aid Profile can be accessed via the internet at www.collegeboard.com; the FAFSA can be accessed at www.fafsa.ed.gov. The Profile is available in the fall and the FAFSA forms are available online after January 1st of senior year. Information about scholarships can be found outside the College Counseling Office, online at www.fastweb.com, and other online sources. Consider, too, parents' place of work, your church, township, etc. Be aware that most monies will come directly from the college you plan to attend. What is the best formula for gaining acceptance into a most or highly competitive college? The frustrating answer to this question is that there is no formula that one can follow to ensure acceptance into any given institution. Admissions professionals themselves acknowledge that the process is much more of an art than a science. The best advice is to pursue your passions, engage wholeheartedly in academics (both subjects you like and those you don't), and challenge yourself. In short, be active in the pursuit of your education and your passions. What is the NCAA Clearinghouse and how and when should I go about registering? The NCAA maintains a clearinghouse for recruiting and eligibility purposes. Students who anticipate being actively recruited for Division I or Division II schools should register to be certified as eligible recruits. Students wishing to register with the Clearinghouse must complete the Student Release Form which can be accessed through the NCAA Clearinghouse website (www.ncaaclearinghouse.net). As soon as you know you would like to play in college, you should plan to meet with the Director of Athletics and develop a strategy.